From goodreads: Twenty-year-old Camryn Bennett had always been one to think out-of-the-box, who knew she wanted something more in life than following the same repetitive patterns and growing old with the same repetitive life story. And she thought that her life was going in the right direction until everything fell apart. I heard so much about this book. Bloggers and avid readers were praising its fabulousness. I had very high expectations when I began to read this story and the first four chapters I was struggling. I kept wondering when will the fabulousness smack me upside the head? There were moments during those chapters that felt a bit draggy and I wasn’t completely engaged. Then something amazing happened and yes, I got smacked upside the head!!! Once I got past those few chapters, I was literally floored by everything!! I was floored by every single moment on that damn bus!! I was floored by every moment that Andrew taught Camryn the beauty of living in the moment!! Most importantly I was floored by the way they fell in love with each other. 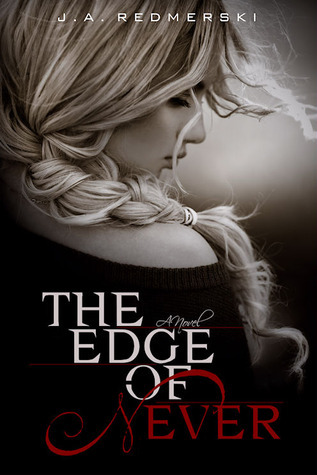 The Edge of Never is about a journey to self-discovery and staying true to who you are. Camryn’s journey had me captivated with her one-way ticket to anywhere and her liberation became my own and it felt so freeing!!! The friendship between Andrew and Camryn unravels into something much deeper and unexpected that I experienced a whirlwind of emotions. As they get to know each other, there is a moment when Cam shares with Andrew why she feels she shouldn’t hurt and his response resonated so loudly with me that I had to take notes. Some of the things that Andrew said to Cam got me so excited and giddy that I found myself blushing! Their moments of intimacy left me breathless. It was raw and beautiful and I found myself wishing I had a cigarette after I encountered those scenes! But this story is much more than those scenes (as auh-mazing as they are) it’s about releasing the demons that paralyze us from truly moving forward in life. The surprise twist comes out of left field and I found myself overwhelmed by the angst. How did I not see that coming? It’s the perfect element of surprise that will leave you with your heart in your throat and you’ll compare every romance novel you ever read to this one. There is a scene during all the angst that I found myself crying. Not crying like a complete lunatic but the kind of crying you can do with the right pair of sunglasses on. It’s the kind of crying you feel to the very core of your being. I was making my way to reading this book but had it not been for my friend Trish who gifted this to me, I would still be living under a rock! “I have never lived the way I lived during my short time with you. For the first time in my life, I’ve felt whole, alive, free. You were the missing piece of my soul, the breath in my lungs, the blood in my veins. I think that if past lives are real then we have been lovers in every single one of them. I’ve known you for a short time, but I feel like I’ve known you forever”. My final two cents: I love this book, I love what it did to me and I’m jealous of anyone that reads this book for the first time. Same here! My friend demanded I read this book and I’m so glad I did. YES! The twist. Great review Christina! I loved this book to bits and pieces!!! I’m glad you liked my review!!! Thank you! I loved it too! And I love the new blog look!!! I’m in love with Andrew!!! I also just read this and really liked it. The slow start didn’t really bother me, but I was wondering when we would get to the good stuff. I didn’t really bother me but I think I heard so many amazing things that I was wondering when it would take off and OHMMMMGEEE…did it ever!